Many places have given rise to games. In India, the Teer game would be that game that has come from the indigenous people. It has seen millions of Rupees exchange hands every single year. It is amazing how the game has such popularity since time immemorial. The popularity is evident when you visit the streets of Shillong, Meghalaya state; you are greeted with a myriad of Teer Game stalls along the streets. When you enter a shop, you find a license number written on the shop's entrance or outside on a chalkboard with a piece of chalk. Inside, the room is tiny and can only provide space for a table and chair for the attendant. Pens and papers are on the counter- a sure sign that you have reached the Teer Game stall! Everyone seems to be indulging in the game because; men, women, and children all alike purchase the Teer Game tickets every day. 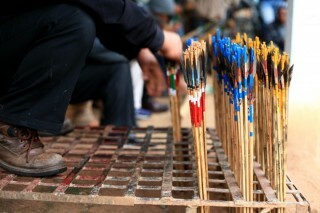 It is a game of archery that is also used to interpret people's dreams. In fact, many foreigners who visit India refer to it as the game of luck and dreams. Being a game of dreams, the players often dream at least once a day to interpret the meaning of their dreams based on their game scores. Interesting myths surround this game. It is claimed that players who keep snakes and worship them often stand better chances of accuracy in the game. How true that remains a mystery but it is true to say that these myths have all the more drawn more people to the game, maybe because of curiosity. Tickets are ridiculously affordable, and this creates accommodative space for anyone to take part in this communal game. The tickets for the game can fetch as much as 90 times its initial worth, making it a very attractive game, hence the popularity. Do not be fooled though. In as much as the returns sound lucrative, it is not as easy to get that much out of your shots. Generally, people gather at the playing grounds at precisely 4:00 pm and the games begin. Shillong has 5 Teer Game clubs. Ten archers each usually represent the five clubs in the first round of this entertaining game. Standing in a semi-circle, they all shoot 30 arrows at their targets in sometimes a record time of 4 minutes. For the Math enthusiast, to begin explaining how 1500 arrows can find their way to a spot in 4 minutes is just phenomenal. When time is up for the first round archers, a curtain falls to ensure that the arrows stop making their way to the target. It is from the arrows that the lucky number is then decided. In this game, cheating is almost impossible because the complexity itself in picking out the lucky number based on the arrows on the target is very tactical. Take, for example; the arrow hits 789, the lucky number will be 89. They pick out the last two digits only. For the second round, more archers from the five clubs, say, 50 archers, shoot 20 arrows each in a record time 3 minutes. The officials then count the number of arrows and the number declared. This result is immediately spread out through phones by agents within the first 5 minutes. This technically means that the lucky numbers in the Teer Game shops keep on changing as the game is played. This legal gambling game has to be one of the most organized gambling games around the world. Despite a lot about its relation to dreams is not openly documented; Teer Game is one unique communal game.